Eco-Babyz: Luxe Baby Shower Giveaway Event | $1400+ in prizes! 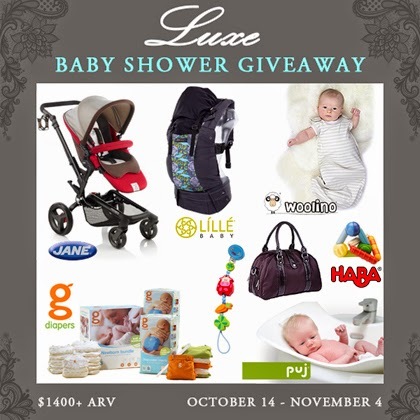 Luxe Baby Shower Giveaway Event | $1400+ in prizes! Are you expecting a baby or already holding your little new arrival? You are going to love this amazing event in partnership with six luxurious baby brands! We are excited to share it with you and to give you an opportunity to own these wonderful, high quality products. Jané USA: The winner will surely be impressed with the fully loaded Jané Rider that radiates elegance and ease. The patented fold on the Rider is designed for those of us who often find our hands full and our minds elsewhere, compressing the stroller to 30% of its upright size. With the kick of your foot you can unfold your stroller with the seat on or off and forward or rear-facing. Adjustable rear suspension, adjustable handlebar with six settings, corrosion resistant anodized aluminum chassis, and long stroller basket are among the superb features. High quality washable fabrics and a water, wind, and stain resistant canopy to top it off. The seat is built for children around four months of age all the way up to 40lbs. and with the addition of the Micro bassinet or Link-Fix adapter you can begin to use your Rider from infancy on. While other manufacturers make you pay for essentials like the diaper bag, rain cover and cup holder, Jané includes them standard with each Rider purchase. The Rider screams style and exudes convenience. Woolino: These 100% natural baby sleeping bags are made with the world's most superior natural fiber - silky soft allergy-safe Australian Merino wool and organic cotton. Perfect for children, merino breathes, regulates body temperature, manages moisture, is naturally fire resistant, non-allergenic, antibacterial, easy care and durable. The Woolino sleep bags are economical since only two sizes are needed from 2 months to 4 years old, it grows with baby and is durable enough to be passed on to younger siblings. The value and high quality makes it easy to see why it is rated a #1 BestSeller on Amazon among baby sleep bags . New for this fall, Woolino now also creates a baby-safe Lambskin Cuddle/Play Rug and you're among the first to find out! This new product that is not yet available on their website. Medical studies actually show that babies sleep in or on merino wool settle more quickly, wake and cry less, sleep longer and gain weight faster! Lambskins have been used worldwide for centuries to keep babies warm and comfortable in any environment. It's also the perfect playmat and is functional even when kids grow older! LILLEbaby: The LILLEbaby COMPLETE carrier is ergonomically designed for the healthiest hip position for baby, whether they are an infant or toddler. There truly is no "babywearing gap" for when this carrier cannot be used. Featuring adjustable neck support, an adjustable sleeping hood, a long adjustable torso, wide padded waist belt, unique lumbar support, and padding on all straps - it is a complete design. It is convenient to nurse in and evenly distributes the weight of the baby so you can babywear pain free longer. The design of this carrier truly takes into consideration the comfort of both baby and parent and behind it are years of design development and testing. An entire team of moms and dads from many vocations contributed to the making of LILLEbaby COMPLETE 6-in-1 baby carrier. Haba: HABA is a family owned and operated company located in Bad Rodach, Germany. Owned by Mr. Klaus Habermaass, whose father started the business more than 72 years ago, the company has grown to more than 1,400 employees in Germany, with additional distribution facilities located in the United States, France, UK and Asia. HABA prides itself on the fact that children love playing with its toys, blissfully unaware of how this fosters their development. HABA products have been bestowed honors by virtually every German toy award and virtually all of the prestigious American ones, as well. Their design intentions are simple: provide value and quality. HABA is one of the only toy companies that obtained the world renowned PEFC certification. All their wooden toys that are manufactured in Germany are made from reforested timbers. 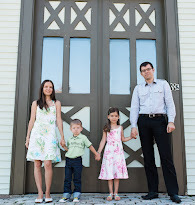 Lässig is also a sustainable, family owned business located in Germany, dedicated to creating consciously-crafted diaper bags, kids' bags, bibs, dishware and other high-quality accessories for the modern family. In addition to being sustainable, Lässig ensures that their products are durable and made to last. Lässig production adheres to strict quality control measures and is constantly monitoring production standards. The Lässig brand embodies an ideal blend of versatility and innovation, with convenient features and chic details to combine fashion, safety and sustainability. gDiapers: gDiapers is redefining the diaper inside and out by giving parents the convenience of disposables and the confidence to build a better future. On the inside, our Disposable Inserts are Cradle To Cradle Certified (cm) Silver, flushable and break down in home compost (wet ones only). On the outside, the soft cotton gPants are designed to let baby’s skin breathe and come in colors and prints that parents love. The winner will have the choice of a Newborn Bundle or the Sweet Bundle (small, medium, or large), a great way to start an easy sustainable diapering routine. Puj: The Puj Tub is the easiest bath tub ever! Made from a soft foam that folds and conforms to almost any sink, the Puj Tub cradles and protects the baby during bath time. Hang or store the tub flat anywhere you would like...even on the back of your door and out of sight! The Puj Tub cradles and comforts baby, is mold and mildew resistant, fits in standard-sized bathroom sinks, works with pedestal and counter top bathroom sinks, Hangs flat for easy and convenient storage. Enter to win this amazing Luxe Baby Shower Package through the giveaway form below. Disclaimer: I received no compensation for this post. This promotion is in no way sponsored, endorsed or administered by, or associated with Facebook. By entering, Entrants agree to a complete release of Facebook. Entrants are providing information to AnaB Social, not to Facebook. Must be 18 years of age to enter. Open to U.S. residents. Void where prohibited. Participating blogs and AnaB Social are not responsible for sponsor prize fulfillment. The stroller and the Gdiaper bundle are my favorites! The g diapers! I love them! All the prizes sound amazing but the Jane stroller is exactly what I need for my baby arriving next year. I love all the features, this would be the perfect stroller for me. I am a huge fan of the Jane USA rider stroller in sand! It's absolutely beautiful! It's chic, classic, sophisticated, elegant, and so so useful! From the smart fabric canopy (water and stain resistant, and 50+SPF protection!) to the ease of being able to unfold this stroller with a simple kick of your one foot...this is brilliant! It's at the top of my list for my baby's arrival in November, I would love to own this stroller- It would be a blessing! Eeeek! How exciting! My favorite is the LILLEbaby COMPLETE! I love baby carriers and this is one I haven't gotten to try out yet! I love the jane stroller! 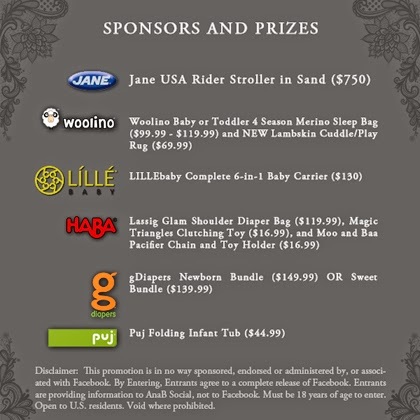 The Jane Stroller is an awesome prize!! We love to go on walks and that stroller looks awesome! The Jane USA Rider Stroller would really come in handy, as I will soon be foster-parenting a baby and toddler! The thing I look forward to winning out of this bunch is the g-diapers. This is for one of my good friends and she has been one of rocks. I would win all of this for her because she deserves it! I love to Jane stroller for their sleek design and durability. The stroller is my fave. Would love to show baby the world cursing around in it. I love the lillebaby carrier. It's bright, colorful, and gender neutral! They are ergonomic for parent and baby! Lillie baby carrier! Love being hands free and still cuddling my babe! I would love love love the Jane Stroller! I'm shopping for one right now but winning one would be amazing! I can't pick a favorite, they all look amazing! I would be blessed to have any of these in my home! My favorite prize is the Jane stroller. I love it because it is easy to fold when you have your hands full. Perfect for a new mom. I love all the prizes , the stroller and the carrier are both amazing and I would love to give them a try! I like the jane stroller and the lillibaby. I love my lillibaby and would love one for my hubby. All of these prizes are so awesome! I would love the lillebaby because I live in the city and it would make getting around with my little one so much easier! Thanks for the chance! The Jane is definitely my favorite followed closely by the lillebaby because they're both awesome companies and extremely useful products. The stroller!! I love it!! I am a soon to be mom and would love to win these! I love everything! My niece needs all of this! She's having twin boys in just a few weeks and will be a single mother! Thank you! Ummm, I am so excited about all of the products in this giveaway! We are about to have our 3rd baby & are needing to replace most of these categories of baby items...and all of these are like our DREAM BRANDS of these items!!!! Thanks for such an awesome giveaway opportunity!! LOVE diapers and would love a lillebaby!! jane usa stroller - we are having our second baby in Feb so this would be great! I like the Jane USA Rider the best. Probably because it beautiful and it's what my daughter needs the most for her new son. I love the jane stroller. I could use a new stroller. I would especially love to have the Lassig bag! The Puj tub is awesome because you can store it flat! I love the stroller! We have been in desperate need for a new one! I am most excited for the stroller because it's my dream stroller!!! The Jane system looks pretttttttty awesome! I like the g diapers. I am late to join the cloth diapering movement and I like how easy this system looks to use. I didn't cloth diaper my first baby, but I'd really like to use cloth with my second child. I like the Haba toys! I'm most excited with the Jané Rider stroller!! I DEFINITELY would love to win ALL of these amazing products, but my favorite would have to be the Jane Stroller. With 4 kids, I need a nice stroller that I don't have to mess with all the time!! Most excited for the Jané Rider stroller since my wife has bee wanting one. She has also been wanting the LILLEbaby carrier to. I love GDiapers--so comfy for baby and good for the environment!